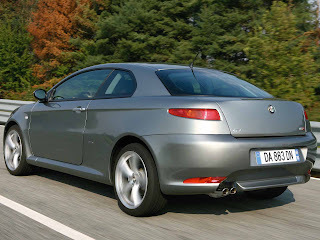 The Alfa Romeo GT (Type 937) is a sports car produced by the Italian automaker Alfa Romeo between 2003 and 2010. A total of 80,832 units were produced. The GT was introduced in March 2003 Geneva Motor Show and it came for sale in Italian markets January 2004. It was built at the Pomigliano plant, southern Italy, alongside the 147 and 159. 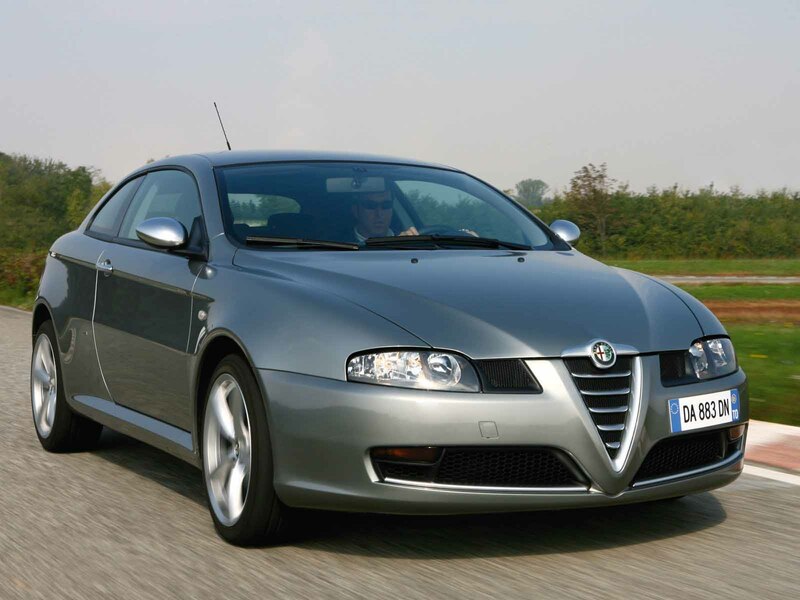 Like the 147, the GT was based on the same platform used in 156, with the coupé body styled by Bertone. Most mechanicals were taken directly from the 156/147 using the same double wishbone front suspension and MacPherson rear setup as those two cars. The interior is based heavily on that of the smaller hatchback 147 and shares many common parts. The GT shares the same dash layout and functions, the complete climate control system as well as having a very similar electrical system. Some exterior parts are taken straight from 147 with same bonnet, wing mirrors and front wings (from 147 GTA). The engine range included both a 1.8 TS and 2.0 JTS petrol engine, a 1.9 MultiJet turbodiesel, and a top-of-the-range 3.2 V6petrol. 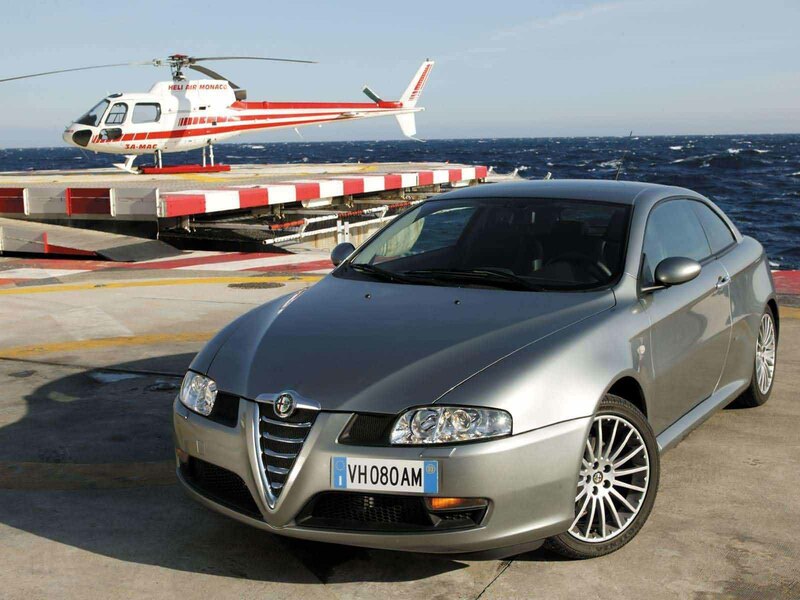 Luggage capacity is 320 l and could be enlarged to 905 l.
The GT was positioned as a sports car in Alfa Romeo's range, and sat alongside the Brera (which was based on the newer mid-size Alfa 159sedan/saloon car). Both cars can be viewed as successors to the 916-series GTV. Keeping two mid-sized sports coupés in production simultaneously is unusual and the two cars could be construed as being in competition with each other. If Alfa Romeo is viewed as the sporting arm of the larger Fiat group however the move makes more sense: with no sporting Fiat badged cars currently in production, the marketplace arguably had ample room for both these cars, each being tailored to a different niche. 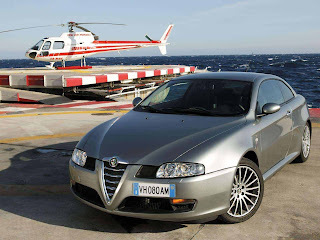 Historically Alfa's strategy of developing sporting cars from their conventional sedan/saloon car offerings has found much favour among traditional Alfisti, and ensured good sales. 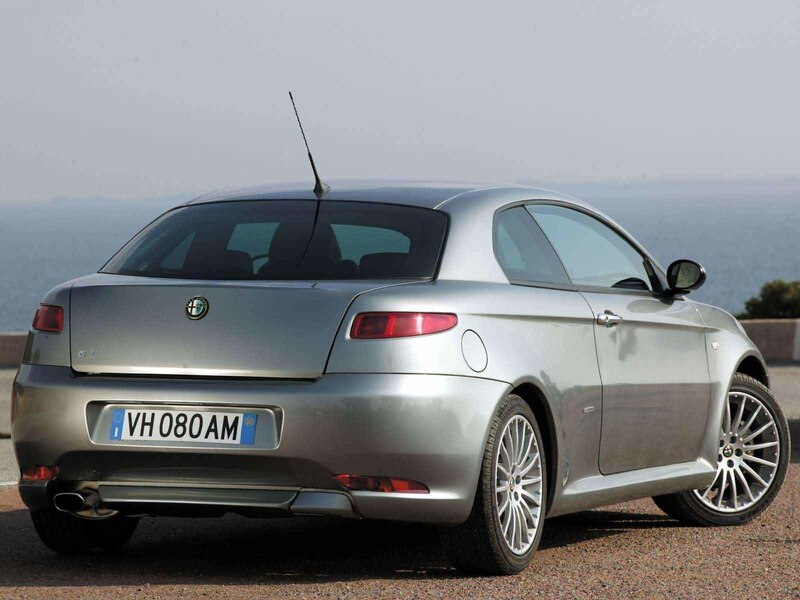 In 2006 Alfa introduced a 1.9 JTD Q2 version with limited slip differential, and also added a new trim level called Black Line. In 2008 Alfa introduced the cloverleaf model as a limited edition complete with new trim levels, lowered suspension, body kit, 18 inch alloy wheels and only available in the colours black, alfa red, or blue. with engines 1.8 L and 2.0 L petrol and 1.9 L Multijet turbo diesel. These are effectively the run out models and as such are very well specified. A few years before the production ended, other than a diversification of the editions for the Italian market, Alfa Romeo decided to issue some particular versions of the GT for foreign markets. The Special Edition 1.9 JTDm 16 (painted in a new red or white) was then assembled for the United Kingdom's Market, following specific orders from the British dealers; the Run Out Edition 2.0 JTS (only black), was built in a dozen of pieces, with a modified engine (a revised version of the Pratola Serra 2000 JTS) and specific parts (audio system bose connected to the USB, multimedia and bluetooth devices - an integrated approach then used in the Giulietta - lowered absorbers, specific alfa romeo grey leather-red signed seats, bigger matt rear view mirrors) assembled only for the Dutch dealers. For the Australian market and the French market the GT was proposed in its Centenario shape powered by the 1.9 JTDm diesel. The Quadrifoglio Oro (60 pieces) Japan-exported version is the very end of the model's career. The GT has been widely acclaimed for its attractive styling and purposeful good looks. The design is by Bertone who have a long history of collaboration with Alfa Romeo, the most notable being the B.A.T series concepts of the 1950s. 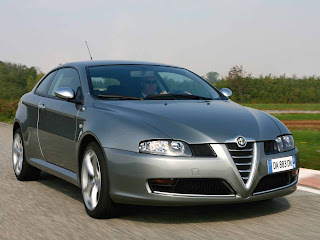 The general coupe shape resembles that of the 1980s Alfa Romeo Sprint but with clear design cues taken from more modern Alfa Romeo products. The GT wears 16-inch alloy wheels as standard, with 17-inch wheels as an option. There are 18-inch alloy wheels available, but the extra width pinches from the GT's 11.5 metres (37.7 ft) turning circle. The 240 PS (177 kW; 237 hp) 3.2-litre V6 offered good all-round performance but is prone to torque steer while the 1.9-litre JTD turbodiesel has proven to be a popular choice in comparison to the petrol 2.0-litre engine. The 3.2-litre V6 petrol unit was positioned as the 'sports' option with its large power output and distinctive Alfa Romeo exhaust note, unique to the Alfa V6 family of engines. The 1.8 Twin Spark petrol engine was lifted directly from the 156, it is a tried and tested unit giving respectable levels of power while still remaining economical. 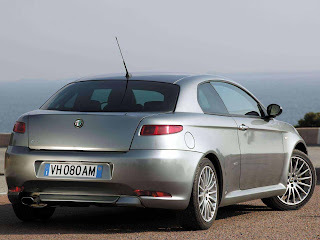 The 2.0L petrol has direct injection and is an improvement on the older 2.0L petrol unit found in the Alfa 156 on which the GT is based, with an increase of 15 PS (11.0 kW; 14.8 bhp) and better fuel consumption. The 1.9 L direct injection diesel unit still is the most popular option, the high torque output at low revs gives more of a feeling of power at "normal" road speeds compared to the 2.0-litre petrol which requires much higher revs to produce its maximum power output and is best suited to being driven hard. This combined with the significant gain in fuel economy (see statistics below) make the diesel a popular choice. The economy of the diesel combined with the power and 6 speed gearbox make it a real GT car with a range of around 600 miles (970 km) per tank at motorway speeds. For stopping power, there are 284 mm (11.2 in) ventilated discs up front and 276 mm (10.9 in) at the rear. The most powerful version 3.2 V6 has 330 mm (13.0 in) ventilated discs at front. The GT comes as standard with anti-lock braking system with electronic brakeforce distribution and hydraulic brake assistance. Despite it being a two-door or coupé, the GT does not have a 2+2 seating configuration but is a five-seater.. This is because of the 156 heritage, sharing the chassis. Entrance to the rear of a GT is via foldable front seats. The GT is also in fact a 3 door with a hatchback allowing access to a large rear boot. The latest technological advances were incorporated, such as VDC (Vehicle Dynamic Control) which is Alfa's version of ESP (Electronic Stability Program), ASR (Anti Slip Regulation) or Traction Control, EBD (Electronic Brake Distribution), ABS, Brake Assist and later the Q2 System. The Q2 system is Alfa's highly developed and efficient Limited-Slip Differential technology, for improved cornering (particularly in the wet) and power transfer to the wheels. This reduces wheel spin, torque steer and eliminates the understeer common to front-wheel drive cars. Details like the wheel camber being set at a negative specification to improve cornering capabilities, as in a track vehicle, were included. Hardened and modified suspensions as opposed to the 156, thus sacrificing marginally on ride comfort for road holding. Extreme body-hugging, adjustable leather seats for minimal lateral movement during hard cornering. All of the above made the GT appealing to the performance-oriented customer. However, Alfa Romeo integrated luxury with its 'caged panther' concept by ensuring the car was highly equipped, with standard features like power steering, trip computer, air conditioning, reverse assist, dual climate control, airbags (including 'curtain' airbags) with internal passenger sensors to decide remotely which airbags to deploy, side-mirror defrosters, and cruise control, plus options like seat warmers, leather interior, ten CD changer, satellite radio controls and windscreen sensors for automatic wiper activation. The combined effect of these specifications created a highly developed, responsive and maneuverable vehicle at high speeds and in challenging conditions, making it safer and comfortable to drive every day at conventional speeds. Approaching the end of its life, the GT was proposed in special versions intended for sale on some markets. In some cases, differences from the national versions were quite impressive. The Special Edition 1.9 JTDm was produced for the British market only, where it had to be preordered by the customer ("run out"). Its unofficial name was "quadrifoglio verde" (cloverleaf). It had leather interiors , Q2,. The Run Out Edition 2.0 JTS gasoline (black only) was assemble in a dozen of pieces for the Dutch dealers only. For what concerns the mechanical part, it mounted a revised 2000 JTS powered 165 CV, while the car is lowered. This version had some specifications improved in respect to the top line; the audio system Bose was connected to a multimedia USB, integrated to the bluetooth blue&me. It has 18 inches alloy wheels, painted brake calipers, black instruments white lighted, black leather steering wheel, alloy pedals. Furthermore, the car is fitted with specific sized grey leather seats and interiors. The "100th anniversary limited edition" version is intended for the australian and south african markets;, and coloured Rosso Alfa, Atlantic Blue, Black e Ice White. The “100th Anniversary Limited Edition” was produced in 130 pieces: 100 for the australian market and 30 for the south african one. Following the overhauling in fashion in that market, that GTs are equipped with the 3.2 V6 with a manual 6 speed cluth. A centenario version is made for the french market. It had a rear view camera, Blue&Me, 1.9 JTDm 16V 150 CV engine. The Quadrifoglio Oro was made in 60 pieces with specifications similar to the dutch Run Out: 2000 JTS powered to almost 170 CV, sequential clutch, red instruments, alloy wheels, red paint. This version ends the assembling of the last bodies of the GT. A softtop GT Cabrio Concept was made by Bertone in 2003, it came in public April 6, 2011. The car was four-seat open version of the GT coupe, which Bertone hoped to get built in their own plant. 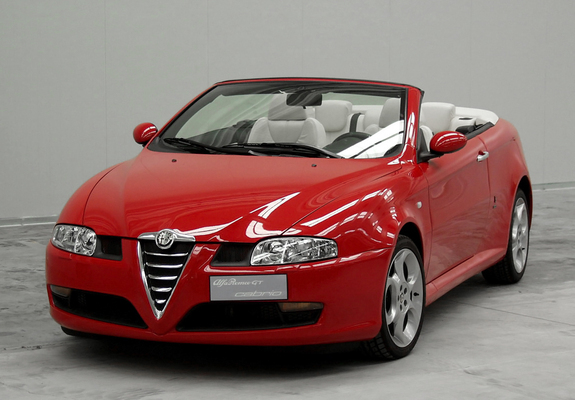 The next generation Alfa open top car was instead built by Pininfarina using the Brera coupe as a base. Last updated on 22 February 2014 at 04:26. The concept version was powered with a Maserati V8 engine producing around 400 PS (290 kW; 390 hp). The Brera was widely acclaimed, and production plans were subsequently announced for 2005. Online repair manuals Alfa Romeo is available online for the owners.